This page contains a character guide for The Joker in Injustice 2. Here you’ll find movelists, combos, juggles, strategy guides and recommended gear for the villain character. For more Injustice 2 content, head over to our Injustice 2 top page. A chemical accident turned an unknown small time criminal into the Clown Prince of Crime, the Joker. More crazed killer than goofy clown, this super-villain’s only goal is to kill his nemesis, Batman. Utterly insane and hiding behind colorful costumes to make himself appear as nothing more than a harmless clown, the Joker is anything but harmless. Possessing no powers outside of his genius cunning, the Joker is still one of the most deadly villains seen in Injustice. His thin, lithe body allows him a surprising amount of speed and athleticism to dodge attacks thrown at him, while his purple suit hides a repertoire of weaponry, ranging from lethal chattering teeth, an acid filled squirting flower, a long barreled revolver, dozens of knives, and the infamous crowbar he uses to pummel his opponents to death. Not So Funny Is It? Enhances Joker’s mobility making him faster than level 1 HA. Enhances Joker’s mobility making him faster than level 2 HA HA. Below are combo and juggle inputs for The Joker , including corner strategies and restarts. He wears a purple suit with a flower on his lapel, skinny leg pants, blood-stained white gloves, a skinny yellow bowtie, a dark green bullet-proof vest, and loose suspenders hanging at his waist. He sports a longer purple coat with black accents, a spiked collar, and slicked back hair. He now has a skinny purple tie and brown dickies. He was also playable in Mortal Kombat vs. DC Universe, another game created by NetherRealm Studios (known as Midway at the time). Richard Epcar reprises his role from Mortal Kombat vs. DC Universe. 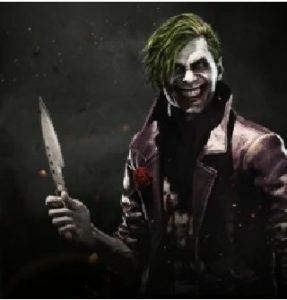 When he defeats the alternate Nightwing in story mode (Injustice: Gods Among Us), he says that he’s going to have to tell Batman that there was “A Death In The Family”, a reference to the story arc in which the Joker killed Jason Todd, the second Robin. He was confirmed playable alongside Green Lantern, later on during the day that Green Arrow was revealed. He is the only villain featured on the game’s cover art. His alternate costume is named “Insurgency” despite the Joker never being a member of Batman‘s Insurgents. He is one of the three villain characters playable in story mode, with the other two being Deathstroke and Lex Luthor.